It really is possible to change up the look of your home each season without going to a lot of trouble. and pull a warm and cozy look together...fast! The painting on the wall in her dining room, above, was moved here from its 'regular' spot in a hallway. 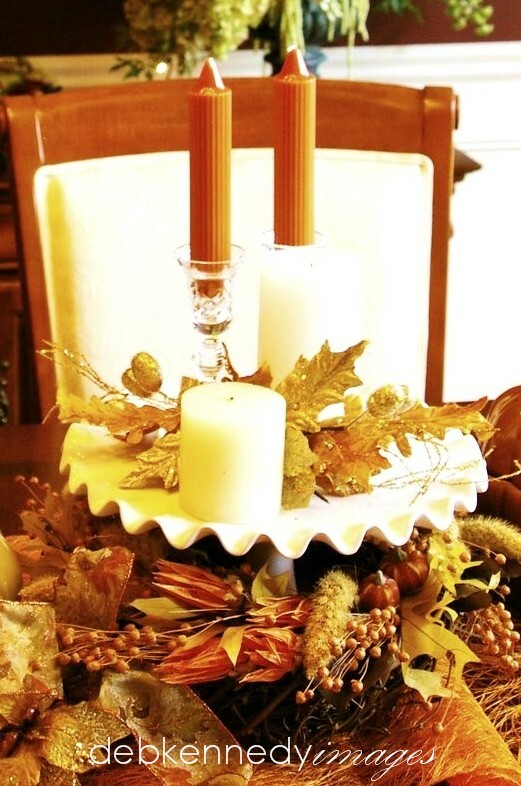 I just had to use it here because the colors are so warm and inviting, and perfectly coordinate with the hues of the centerpiece. The painting that is usually hangs in the dining room has cooler tones in it, and looks lovely in the hallway now. 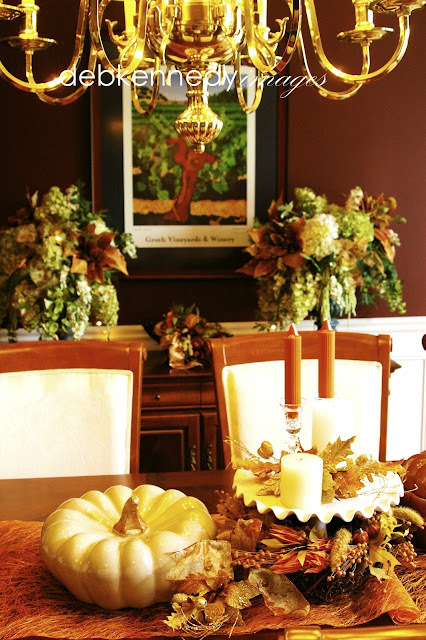 Moving your art around seasonally not only helps you to get a fresh new look in your rooms, but also provides you an opportunity to notice and appreciate your art more. It's easy to speed past this lovely work of art when it's in the hallway - but in the dining room, one can sit and enjoy the scene during a leisurely meal. Those big urns with arrangements of silk hydrangeas on the buffet stay here year-round as 'base pieces'. Seasonal changes are achieved by simply tucking additional flowers & foliage in there to change it up a bit each season. It's really not necessary to get something completely new - just a bit of restyling makes a huge difference. What look like leaves in the photo are actually huge velvet poinsettias in a gorgeous rust color - I nestled them into the sides of the arrangements so that they don't really look like poinsettias. 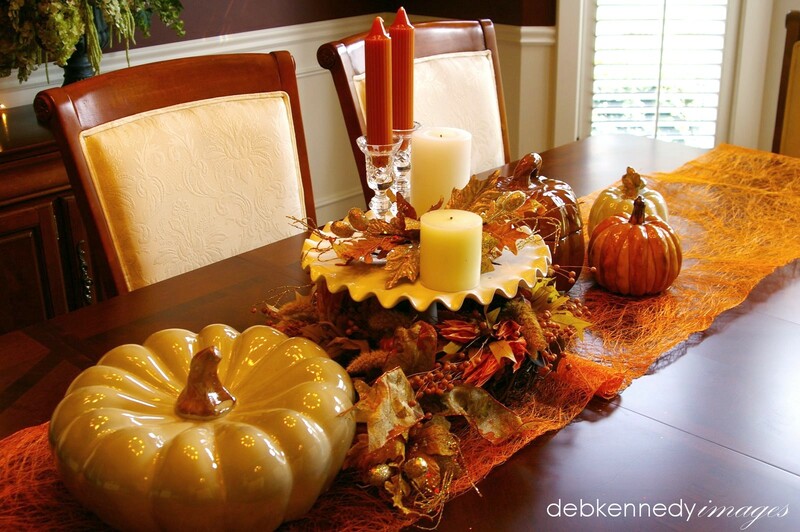 The tablescape is oh so simple - which is important, because my client could remove it easily for entertaining. She had a toddler and TWIN infants at the time, so a lot of activity was happening around this table. When she wanted it to look beautiful, she could easily re-create this simple arrangement on her own. The runner is a really inexpensive roll of spun cocoa fiber that my design partner Karen picked up at the local craft store - it comes doubled up, but we liked the look of just one layer because it's almost like the delicate veining in fall leaves. We unrolled it and let the ends just curl under the table sides. Then a collection of ceramic pumpkins was placed very causally on the runner. In this close-up you see yet another way to use a wreath! Here, one made of wheat & various seed pods surrounds the ivory cake plate. If she wants, my client can remove the candles and leaves on the cake plate to display a fancy dessert there during her dinner party. Like I said - EASY! This woman had EXCELLENT taste. She hired an interior designer to help her furnish and decorate this beautiful executive home. She hired me to come with my design partner and decorate her rooms for every season. But she, herself, would never EVER buy a new thing for the house or move anything that was already there. Not on the mantel, not on the table, nothing. She felt we were the 'professionals', the 'experts', and knew more than she did - so she just waited around for us to come and decorate. For the five years that I decorated for her, we encouraged her to change up the entry table or the mantel or the dining room table centerpiece - nope. Wasn't going to happen. I loved working for her, but I just wanted to shake her and say "It's YOUR HOME. Live in it!!" No one is more an 'expert' on your home than YOU are! I hope all of you out there in blogland feel 'at home' enough in your rooms that this is not a problem for you! In the entry, I used the same trick of adding faux stems to an existing 'everyday' arrangement - a swath of bright leaves and berries tucked into this urn of magnolias adds a pop of color. A few funny little faux pumpkins add whimsy but still work with the more formal nature of the home. 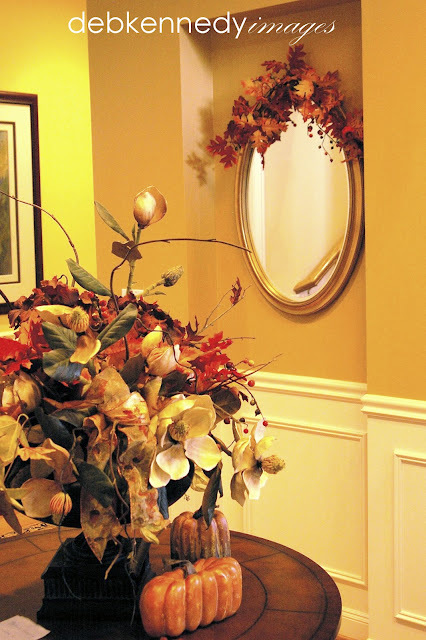 A snippet of the same leaf & berry garland tops the mirror on the wall, coordinating the look. The moral is: When you see a seasonal garland or bunches of leaves/flowers that you love, buy a few of them. You can cut them apart or use them whole in many different ways around your home - but the whole look stays coordinated and 'designed' because some of the elements repeat themselves from room to room. This close-up of the mirror shows the OH SO SIMPLE garland just bent over the top edge of the frame. 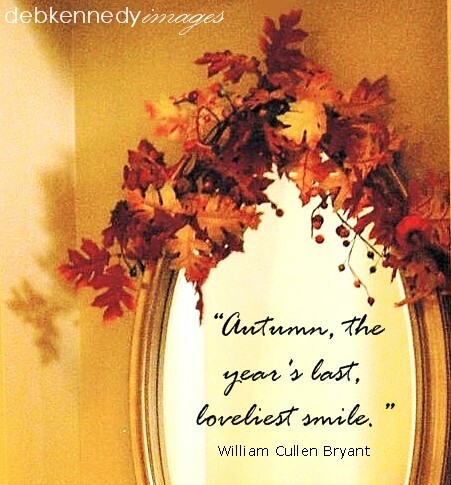 And though I added the beautiful autumn quote to this photo in my editing program (as suggested in this post), it would be SO easy to use a transfer to put a quote on your mirror for the season. When the seasons change, grab a credit card and scrape the transfer ink off of the mirror. 5. when your indoor flowering plants stop blooming, you can FAKE IT! go to a local craft store or fine garden center, and get a few stems of the same flower that grows on the plant naturally. (Orchids, Calla Lilies, Poinsettias, Mini Roses, for example) and then insert the FAUX STEM right next to the real stem of the plant. Nestle the faux flowers into the real foliage, and your refreshed plant is ready for the season! What a wonderful posts, you tips are always right on point. I love your way of displaying and using items out of their original meaning. Great tips! I'm the world's worst for thinking that I have to run out and buy the latest and greatest with each new season/holiday.